Sorry about the introduction picture! 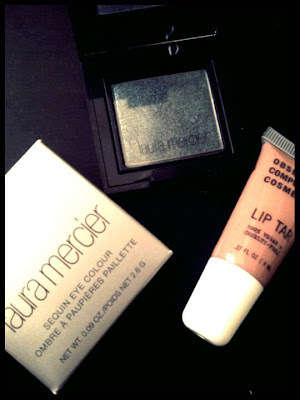 I'm in a little bit of a rush, and this picture together with the Laura Mercier eyeshadow is so pretty! I'm reviewing the Obsessive Compulsive Cosmetics Lip Tar in Hush today. By the way, I must mention the online store I bought this product from! I got it off Lehved.com.au, as so helpfully recommended to me by CendanaK from Blushfully. I paid AUD 6.95 for shipping at probably about 7PM, and it arrived at my doorstep the very next morning! The funny thing is, I didn't even choose the express shipping option! Okay, back to the lip tar. So far, I am loving this product! I've worn it out for outing after outing, and I can't get enough of it! 'Hush' is a lovely pink colour with very slight coral undertones. The colour can be applied really sheer (use verryyyy little, because a little goes an extremely long way! ), or it can be layered for an extremely opaque, full-colour effect. Here, I am using an amount about the size of an apple seed (random, I know) - which should show you how opaque this product is. When you first apply the lip tar, it is quite fluid and easy to spread. However, after it settles, it tends be a little drying - so I suggest prepping your lips with some lip balm beforehand. I am really impressed with these lip tars, and I'm definitely going to purchase more. Oh, and I heard you can mix these colours to create more, and there is such a huge selection of colours that you can mix and match!